The LMV series of average responding rms reading ac millivoltmeters are applicable to a wide range of general purpose single or dual channel measurements. Both models feature a high sensitivity of 100 µV and range to 300 V rms maximum full scale with a wide bandwidth of 5 Hz to 1 MHz for the LMV-181A or to 500 kHz for the LMV-186A. 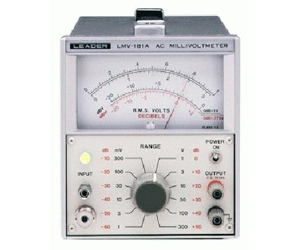 Meter scales are conveniently calibrated in millivolts and dB (0 dBV = 1 V and 0 dBm = 0.775 V) with accuracies to within ± 2% f.s.